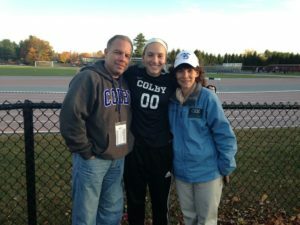 Sam, an athletic 21 year-old, experienced her blood clots while studying at Colby College in Maine. Inspired by her experience, she is interning this summer at the Thrombosis Research Group at Brigham and Women’s Hospital. Sam hopes to go to medical school after she graduates. When did your experience with blood clots begin? I’m a rising senior at Colby. 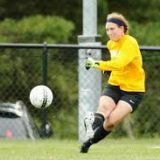 During my first two years of college, I was on the soccer team. I played goalie. I had been super involved in athletics since I was a little kid. It didn’t make a lot of sense. I took it easy for couple days and applied iced. A few days later, it was gone. There was no leg pain. Then I slowly felt my stamina deteriorating. I was getting tired during simple exercises. As I got closer to my tryouts, I was having heart palpitations without really knowing what they were. My chest was very tight and I was incredibly fatigued. I had all of these symptoms that I couldn’t explain. When did you realize how serious the problem was? On the day of my soccer team’s fitness test, August 30th, I had to drop out of the test because I couldn’t breath, and I had this horrible burning pain in my lungs. I had no idea what it was, because I should have been really fit given all of the training I had done. That’s when I knew something was wrong. I went to the health center at Colby and, luckily, met with a nurse practitioner who had seen pulmonary embolism (PE) in young people before. She knew to order me a D-Dimer test. I went to the hospital right down the street from school and got a CT scan, which later revealed that I had multiple bilateral PEs. On August 31st, I was admitted to Maine General in Augusta, and I stayed there until September fifth, which was my twenty-first birthday. I was the only patient on the floor under seventy when I was admitted. My mom said they treated me like a rare unicorn, because they weren’t used to seeing young people like me. I got discharged on my birthday and I started classes the next day. The doctors wanted to keep me one extra day because my INR wasn’t therapeutic yet. My levels were low, but I refused to miss the first day of classes. So, I had to give myself lovenox shots, which were really not fun. But, I went right into classes. Do you have any family history or do the doctors know why you got them? Yes, my clots were provoked. My grandfather had a history of deep vein thrombosis and pulmonary embolism when he was much older, and he had a lot of comorbidities. I was also taking birth control pills, which I’d been on since I was seventeen. I definitely think that the relationship between birth control pills and thrombotic events is one that isn’t really discussed as much as it should be. On top of that, the doctors found that I’m heterozygous for the prothrombin gene mutation. So, with family history, genetics, and the triggering estrogen pills, it was the perfect storm. It’s been eleven months since the episode. I feel much better, physically and mentally. I was on warfarin for seven months. I know there are a lot of newer treatment options, but my parents were familiar with warfarin and felt comfortable having me go for weekly INR check-ins when I was away at school. I came off warfarin and have been feeling pretty good. I do cardio every day, taking an off day here and there, and I make healthy choices. The most immediate change in my life is that I’m not going to play soccer next year. Mentally, I’m just not ready yet. When you’re on warfarin, you have to avoid trauma. You have to live life so cautiously. I’m trying to minimize my risk of having another episode. But, other than that, I did well in school and was able to do most of the things that I’ve always done. Being a year out, I still have anxiety, but this experience has given me a whole new perspective on life. I stopped stressing the little things so much. My mindset switched from a “have to” to a “get to” attitude. I viewed everything that used to stress me out as a privelege. In classes I thought, “Wow. Everyone’s worried about taking this exam, but two weeks ago I didn’t know if I’d ever be taking another exam.” I was lucky to be at school and sit for any exam, because I could have easily died from this. What would you want other blood clot patients your age to know about your experience? At first, when I was in the hospital it was awful, because I went from a perfectly healthy athlete to a sick person. I felt physically horrible. Then, upon discharge I returned to my tiny liberal arts school and it seemed like everybody had their own perfect life while mine was going up in flames. Initially I thought, “Why me?” I didn’t smoke, I worked out, I wasn’t supposed to be sick. My advice to anyone going through any health problem is to try to find the silver lining. I worked really hard to find the good in a very bad situation. I connected with the Thrombosis Research Group, and through studying what I have and reading other patients’ stories, I’ve realized that I’m not alone in this. It’s important to know that you are never alone in your struggles, and you can’t look at yourself and say that you’re defined by your medical condition. The way everyone was reacting when I was first diagnosed, I thought “Wow. I am such a medical anomaly.” But the more people I talked to, the more I researched, and then coming to Boston, I’ve learned it’s really not the case because PE and DVT can affect just about anyone at any point. This can really happen across all ages and genders. Did this impact your decision to become a doctor? I’ve wanted to be a doctor since I was ten years old. But, when I became the patient myself, I gained a new appreciation for life that furthered my desire to practice medicine. It’s important to listen to your body. If something is wrong and you have a gut feeling about it, get yourself seen by a nurse or a doctor, instead of trying to tough it out and risk a bad outcome. Nobody is invincible, and when you’re an athlete you tend to think you are. I definitely thought I was. Anything can happen on any day, which is why you have to live in the moment and make the most of the time you have with the people you love.